On that day, January 6th, 1979, Sirous Amouzegar and Dr Razmara, a Paris-educated Cardiologist who had accepted to become Health Minister, had shared a government car on the journey which was to take them from Bakhtiar's house to the northern suburbs of Tehran where the royal palace was situated. "Although I had been named Information Minister," Amouzegar recalled, "I was genuinely nervous about the future. My heart was filled with pessimism. During the journey to the Palace, Manuchehr Razmara and I hardly spoke to each other. There was an incredible tension in the air. The future seemed very bleak. In part our silence was due to the heavy burden we felt on our shoulders. Neither of us, especially me, had any experience in the ways of government. But we had accepted to risk everything out of a sense of personal loyalty to our country and Dr Bakhtiar who was a truly brave and decent man." In those revolutionary days, the entire area near Niavaran Palace was surrounded by Chieftain tanks and heavily armed elements of the imperial-guard force stationed at all strong points. The main gate was opened and the government car was swept through by an officer halting near the main entrance of one of the older palaces that served as the monarch's private office. The ministers were greeted at the door by the elderly Court Minister Ardalan, a man with a full set of white hair and gentle demeanour, who led them across the splendid Persian carpets that covered the floor. Fragments of light bounced off the gilt-framed mirrors. Royal portraits of the Shah and Empress Farah competed with the antiques that stared at them from the walls and shelves. In the waiting room, Bakhtiar's ministers sat on Louis XV chairs beneath the chandelier, sipping tea. "There were ten other faces in that room," Amouzegar recalled. "I sat down beside Mr Ahmad Mirfenderski, a former ambassador to Moscow who told me that the Prime Minister was in audience with His Majesty." "Although we were not known to each other," Amouzegar said wiping his brow, "Mirfenderski and I were to become close friends. A man with a first-class mind, Bakhtiar had forced him out of semi-retirement to offer him the post of Foreign Minister." There was a long wait -- one and a half hours -- during which the Shah and Bakhtiar remained closeted behind guarded doors discussing details to which nobody was privy. Some of the ministers became restless, even joking between themselves that perhaps the Shah had changed his mind about Bakhtiar. Every so often the Court Minister would shuffle in requesting the ministers to be patient. More tea was served by the few remaining palace staff. "In the midst of the chatter," Amouzegar reflected, "I sat on my chair looking out the window at the trees in the royal garden. I was filled with doubts about our chances of stopping Khomeini. The clock on the mantelpiece was ticking like my heartbeat. All I could think of on that gloomy day was how did I get here?" There was a moment of silence during which I observed this tall man with the features of De Gaulle. At the time of the revolution he had been 44 years old. Now at 67 Amouzegar complained of diabetes and sore feet. His memory was also rusty when it came to dates. "I don't read anymore," he said, playing with the glasses which hung from his neck. "It tires me. I used to have a great library in Iran with 7,000 books. I tried to write my memoirs but gave up although I have given a few interviews to a radio in Los Angeles." Amouzegar now plunged into a rambling discourse on the events that had led the Shah to turn to a member of the National Front to save his throne. "Two years before the revolution," he resumed, "the Shah had become obsessed with his legacy and the future of the dynasty and his son's sucession. Coupled with the military and economic development programs he now contemplated democracy." According to him the Shah and Prime Minister Hoveyda had made secret overtures to members of Mossadeq's then banned National Front to ask them to take up seats in the Majlis as members of a loyal opposition. The Shah's only condition was that they accept the monarchy and his undisputed position as king. In 1977, three members of the National Front, Karim Sanjabi, Daryoush Forouhar and Dr Shapour Bakhtiar, had sent the Shah a letter asking him in respectable language to heed their calls for greater freedoms within the Constitution. "The Shah read the letter with little reaction," Amouzegar said. "Despite a few clumsy attempts to intimidate the signatories the Shah soon realised that the time for change had come. Impressed by the example of Franco and Juan Carlos he believed that Iran could take a giant leap from autocracy to democracy." But events were already working against the Shah's regime. The gradual opening of the imperial system coincided with a rise in dissident activities from Islamic fundamentalists and leftist guerrilla groups. University students and bazaar merchants were grumbling. By 1978 the government of Jamshid Amouzegar (a first-rate technocrat) was struggling to reverse the sudden downturn in the once prosperous oil-driven economy. At the same time he initiated a series of unpopular fiscal reforms and halted the funds paid to the clergy. Such policies led to the riots in Qom and Tabriz which took a nasty turn when ill-equipped security forces opened fire thus creating the first martyrs of the revolution. At about this time, the Shah intensified his efforts to co-opt the liberal opposition into forming a national government that would be acceptable to both sides. "Suspicions ran deep and little headway was made," Sirous Amouzegar told me. "A few patriotic people tried very hard to make it work but egos got in the way." One day, in the spring of 1978 a friend invited Amouzegar to a party where he was to meet a man who changed his life. "I first met Shapour Bakhtiar at a marvelous barbecue," he recalled. "I was impressed by his noble character and extraordinary knowledge of French literature, Persian poetry, European history and Iranian traditions. Whether quoting Hafez or discussing Voltaire he demonstrated a rare intelligence that often left me in awe. As I got to know him better I became convinced of his integrity and patriotism. He was rather unique." An elegant and well-mannered man, Shapour Bakhtiar had led a life full of adversity. Born in 1914 in the south western Bakhtiari region of Iran he had lost his mother when he was seven. Attending elementary school in Shahr-e Kord and then secondary school in Esfahan he was sent to Beirut, Lebanon where he received a high school diploma from a French school. Later while studying in Paris in 1934 he learned the tragic news that his beloved father, Sardar Fatteh, a powerful khan, had been hanged on orders of Reza Shah Pahlavi. Bakhtiar returned to Iran and remained there for two years. He then went back to France in 1936, where he earned degrees in political science, philosophy and law in 1939. In the same year, he married a French woman. In 1940 he served in the "Orleans" battalion and fought the Nazis with the French resistance. In the winter of 1946, Bakhtiar returned to Iran armed with a PH. D from the Sorbonne and later entered the Ministry of Labour in 1951. After the 1953 events that led to the fall of Mossadeq's government Bakhtiar opened a law practice. Although related to Queen Soraya, the Shah's second wife, Bakhtiar repeatedly found himself in trouble with the regime. In the following years he was jailed for opposition political activities and rose to deputy chief of the banned National Front. 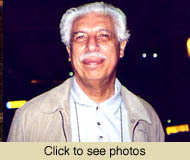 Stubborn by nature, Bakhtiar remained a firm critic of the Shah's regime and was subsequently imprisoned for a total of nearly six years and prohibited from leaving the country for a period of ten years. "When I met him," Amouzegar explained, "Bakhtiar was making a good living with a French-Iranian firm called Vatan. Despite his pro-Mossadeq views and his grudge against Reza Shah for executing his father, Bakhtiar remained a monarchist." In June 1978 the Shah replaced the long-time head of SAVAK, General Nassiri, with General Nasser Moghaddam who had good contacts with the religious and liberal opposition. At this point, Khomeini had still not emerged as the unquestioned leader. On several occasions Moghaddam approached Bakhtiar to seek his views. That same summer, Amouzegar travelled to England for a medical check up. Three months earlier he had suffered a mild heart-attack in Tehran and his wife insisted that he needed a rest. While in Porthsmouth one day, Amouzegar walked into a pub. On the television he saw a map of Iran and a brief report about the latest disturbances. "When I asked the grumpy pub manager what was going on he simply shrugged his shoulders," Amouzegar recalled. "I later discovered to my horror that over 400 innocent people had been burned alive in Abadan after Cinema Rex was torched by Islamic terrorists." The Abadan tragedy was quickly exploited by revolutionary agents who blamed SAVAK for the "hideous crime." The Shah who had on August 5th promised free parliamentary elections for the following year, removed Jamshid Amouzegar, Hoveyda's successor, and appointed as prime minister Jaafar Sharif Emami. The new government tried hard to win over an angry public. "I returned to Tehran immediately," Amouzegar explained. "Soon afterwards I joined a committee of 40 influential people determined to find a solution to the political crisis. I held long discussions with Bakhtiar. We used to walk around his pool in the garden of his house or discuss the future in his basement library." Bakhtiar's sense of loyalty and history prevented him from calling for the Shah's overthrow.He was worried that a revolution would mean Iran's ruin and feared that the communists and mullahs would take over. At the same time he advocated a constitutional monarchy where the King would reign over a democratic parliament. On a number of occasions, even after Sharif Emami had become prime minister, Bakhtiar tried to send word to the Shah through Jamshid Amouzegar and later via SAVAK General Moghaddam that the National Front was prepared to negotiate over a truly representative government. When the Shah agreed to consider an appropriate candidate the National Front leaders could not agree on a name. By September 8th, rioting had reached such proportions that the Shah was forced to impose martial law in Tehran and eleven other cities. Two months later, when Sharif Emami failed to restore order the Shah appointed the ineffectual General Azhari as head of a new military government. On November 6th during an emotional television and radio speech the Shah urged the nation to give him time and stressed that he had finally heard the "voice of the revolution". Calling on all patriots to join hands in ending the crisis he promised to rectify past errors and lead Iran towards a truly democratic system. By now every mosque in Iran had become the hotbeds of dissent where the faithful flocked to hear the taped cassettes of Ayatollah Khomeini who had taken refuge in the French village of Neauphle-le-Chateau near Paris. As the situation deteriorated further the Shah came under increasing pressure by his generals to order a massive crackdown. But the Shah hesitated, caught in a tragic dilemma. At the end, Shah Mohammed Reza convinced himself that a sovereign could not save his throne by shedding his countrymen's blood. Isolated at Niavaran Palace he spent most of his time on the telephone. "Do the impossible to avoid bloodshed," he told a general who had just witnessed a crowd pulling down his statue. In his private conversations with the US Ambassador Sullivan and British Ambassador Sir Anthony Parsons, the Shah subjected them to long, rambling soliloquies expressing his doubt, impotence, and frustration. The anguish was clearly etched on his face. Amouzegar reminded me that throughout November and December 1978 the Shah had resumed his secret talks with opposition leaders. He contacted Dr Sadighi, a member of the National Front. Sadighi agreed without conditions to try to form a coalition but urged the Shah not to leave the country warning of the dangers of collapse. When Sadighi failed to form a government the Shah turned to Karim Sanjabi who had met with Ayatollah Khomeini a few days earlier in Paris. The antipathy between both men was too great and the talks ended after thirty minutes. In his memoirs, the Shah wrote that Bakhtiar had "behaved in a discreet and reserved manner." The Shah had agreed to receive him. General Moghaddam had brought him to the Palace one evening. They had had a lengthy conversation in which Bakhtiar profusely expressed his loyalty to the Constitution and the Monarchy. He wanted to adhere to the Constitution and name a Regency Council before the Shah left the country ostensibly for a long "holiday." "One day over lunch," Amouzegar said, "Bakhtiar told me and Dr Razmara that he had received a call from Lord George Brown, once Foreign Secretary in Britain's Labor Government. Brown had met the Shah and persuaded him to name Bakhtiar prime minister. We spent the next few days drawing a list of potential ministers. There was a lot of pressure from the Court and even the Empress for results. The National Front did everything to discourage people from joining us." On the evening of December 29th, General Badrei, the commander of the Imperial Guard, escorted the slender and mustached Bakhtiar up the staircase of Niavaran Palace to the Shah's private office. It was Bakhtiar's second audience. "Time is pressing," the Shah said impatiently. "Tell me if you are ready to form a government?" Bakhtiar explained the difficulties he was facing to find the right people and asked for another ten days. "It's too much," the Shah said pacing the room. "Sire, I cannot go any faster," Bakhtiar replied. "But I will try, Majesty." After the audience, Bakhtiar left the Palace with a heavy heart. He kept reminding himself that if the Shah had summoned him it was because he had no one else to turn to. "At this point," Bakhtiar later wrote in his memoirs, "I was tempted to tell the Shah to go find someone else. Yet, the truth is that it no longer concerned the Shah, not even the Constitution, but Iran. Iran, a reality superior to all other considerations." With mandate in hand, the prime minister designate faced his colleagues with the task ahead. "Karim Sanjabi was jealous," Amouzegar remembered. "Forouhar was fearful of a split in the opposition and afraid that Bakhtiar might have gotten a jump on him. The rest of the National Front members accused him of betrayal. After three hours of shouting, Bakhtiar left the meeting with a red face. The next morning, Sanjabi rang him to say that he had been unanimously expelled from the party." 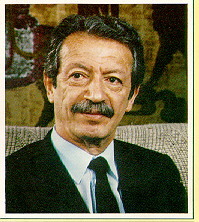 On January 1st, 1979, Shapour Bakhtiar went on television and publicly reaffirmed that His Majesty intended to leave the country once he had formed a Cabinet. The reaction from the military hardliners was swift. General Manuchehr Khosrowdad, a dashing paratrooper declared: "His Majesty has no intention to leave the country at such a critical moment, not even for a holiday!" "From the very beginning Bakhtiar upset the military high command," Amouzegar reminded me. "It was an uneasy relationship with neither side trusting each other. This distrust did not bode well for the future but Bakhtiar felt he could win the generals over once they appreciated his efforts on behalf of Iran." And so on January 6th, 1979, Amouzegar arrived at Niavaran Palace which resembled an abandoned castle. Gone were the regiments of footmen, pages, butlers, adjudants, servants, orderlies, protocol officers, guards and other palace officials, only a handful of the faithful had remained. Others had either asked for sick leave or simply vanished. All this added to an already depressing atmosphere. Everything appeared faded and triste in the vast royal abode. The ministers were now led into a large reception room beautifully decorated with Persian glass and chandeliers. "None of us wore any gold-braided uniforms," Amouzegar remembered. "The Court Minister did not even bother to line us up according to our ranks. This would have been unthinkable a few months ago." When the Shah walked into the room Amouzegar was startled by his grave appearance. The monarch looked pale and there was a slight tremble in his face and hands. Looking tired and drawn in a somber business suit, he turned to Prime Minister Bakhtiar who courteously introduced his ministers. Despite his deteriorating health and anxious state of mind the Shah tried to keep up his haughty bearing. "His Majesty walked down the row extending his hand for the nervous ministers to kiss," Amouzegar recounted. "When he approached me I simply bowed and shook the royal hand much to Bakhtiar's displeasure who later scolded me." When he had finished greeting the ministers, the Shah turned and asked for a microphone so that he could make a small speech. "It was an embarrassing moment," Amouzegar said, rolling his eyes. "For a moment the Shah stood there waiting for someone to hand him the microphone but there was nobody there to help. It was a tragic moment. At the end, Bakhtiar had to leave the room and look for the microphone. It was really the end of the Shah's absolute rule." Finally, the Shah addressed his ministers. "For some time," he said, "I have been ill and in need of medical treatment which due to the situation in the country has been long overdue. I urge you gentlemen to serve your country and support the Prime Minister. In my absence a Regency Council will be created. The Shahbanou and I plan to go abroad for a short trip and much needed rest." On January 16th 1979 Sirous Amouzegar, now settled in his ministerial office, watched the royal departure on Iranian television. "Bakhtiar had gone to the airport to bid the Shah and the Empress farewell having received a confirmation vote from both houses of Parliament," he said. "When I saw the Shah's tears I could not hold back my own. A few moments before several loyal officers had thrown themselves at his feet urging him not to go. It was a pathetic scene." No sooner had the Shah's plane lifted into the sky that the streets exploded with jubilant demonstrators burning his portrait and honking their car horns. "Looking out my window," Amouzegar said, "I felt disgusted and told myself that in their hysteria the people were completely unaware of the dark future awaiting them. It was like witnessing a nation commit collective suicide. That day I decided to put a picture of the Shah on my desk. Whenever a colleague told me to remove it I said that I considered him the lawful king of our country until stated otherwise." A few days later, Prime Minister Bakhtiar held his first Cabinet meeting in a large room. The ministers sat around a polished table. Khomeini and Sanjabi had called his government "illegal" and were urging his ministers to resign or face the music later. In Tehran and other major cities thousands of hysteric demonstrators marched chanting, "Bakhtiar, Nokar bee ekhtiyar, Bakhtiar, the Servant with no power." Standing beside a photo of Mossadeq, Bakhtiar addressed his ministers in a strong voice. "Gentlemen," he said, "Our country is in mortal danger and we all bear a heavy burden on our conscience. I believe that if we stand firm and demonstrate our courage in the difficult days ahead we will be able to weather the coming storm. Of course, any minister who does not want to stick around can resign." "Listening to Shapour Bakhtiar that day," Amouzegar confessed, "I was filled with renewed optimism. A few weeks ago I would have given him a five percent chance of success. But as he spoke my confidence rose and so did my belief that we could halt the madness and prevent Khomeini's followers from seizing the country. Only one minister resigned that day and ironically he was thrown in jail after the revolution. Each time I felt low Bakhtiar would raise my morale and urge me to hang in there. We needed three months to win public opinion and prepare the grounds for a genuine referendum and free elections, he would tell me." Dubbed "the Iranian Kerensky" by foreign reporters, Bakhtiar made daily appearances on radio and television warning his compatriots of a dictatorship worse than anything seen in Iranian history. At the parliament he unveiled several measures designed to appeal to elements in the opposition. He lifted restrictions on the press; the newspapers, on strike since November, resumed publication. He set free the remaining political prisoners and promised the dissolution of the secret police, the lifting of martial law and free elections. But the masses ignored him. On February 1st, after refusing to see Bakhtiar in Paris, Ayatollah Khomeini flew to Tehran amidst great popular acclaim. "Until the last minute the government was torn between diverting his plane to Kish Island in the Persian Gulf or letting him land," Amouzegar revealed. "A few Air Force officers like General Ayat Mohagheghi volunteered to crash their jets against the chartered Air France plane. At the end permission was granted and Khomeini landed safely with his entourage. During the coverage of his arrival a few loyalists interrupted the TV programme with a portrait of the Shah and the imperial anthem." Escorted to the Behesht Zahra Cemetery where many of the revolution's martyrs were buried, Khomeini announced that he would "smash in the mouth of the Bakhtiar government." He called for strikes and demonstrations to continue. The military high command kept their nerve and General Abbas Gharabaghi, the Chief of the Supreme Commanders Staff, warned his fellow officers against any rash attempts to stage a coup against the Bakhtiar government. But the loyalty of the imperial iranian armed forces was already eroding after months of confrontation with the people on the streets. Desertions became commonplace. Meanwhile, a girls' secondary school at which Khomeini established his headquarters in Tehran became the center of the revolutionary movement. A multitude of decisions were handled here by what came to be known as the Komiteh-ye Imam, or the Imam's Committee. On Febuary 5th, Khomeini named Mehdi Bazargan as prime minister of a provisional government while in many large urban centers the local komitehs (revolutionary committees) seized control. Bakhtiar reacted in true style. "The Iranian nation and the Iranian state are indivisable entities," he said. "One country, one government, one constitution, or nothing else." Several pro-Bakhtiar demonstrations in the Aryamehr Stadium were held in Tehran with elegant men and women waving tricolor flags and weeping their support. "Bakhtiar hold your position," they chanted. The crowds soon grew from 40,000 to 100,000. Encouraged by the demonstrations in his favour Bakhtiar declared: "I shall remain in the position of the legitimate prime minister of this country until future free elections are held. Whoever enjoys a majority, shall govern -- An Islamic government limited to Qom is permissible, and we shall then have a Vatican too." Behind the scene however Bakhtiar and Bazargan engaged in furious secret negotiations. "Many meetings were held either at my house or that of Senator Jaffroudi," Amouzegar said. "Both sides were afraid of a civil war. One day Amir Entezam told me to quit. He said that many generals had secretly joined the revolution. I laughed. But when he hinted that Gharabaghi was among them I lost my smile." On February 8th, uniformed airmen appeared at Khomeini's home and pledged their allegiance to him. "The armed forces must return to the people," the Ayatollah said. "They will be welcomed with open arms. Islam is a forgiving religion." The end began unexpectedly on a Friday night, February 9th. In order to discredit Khomeini, Bakhtiar had instructed the television networks to broadcast the Ayatollah's interview with a foreign journalist before his return to Iran. Asked about his feelings after spending 15 years in exile, Khomeini had replied, "Nothing!" Instead of generating support for the government's position the film provoked a mutiny among Homafar air force technicians at Doshan Tappeh Air Base outside Tehran. They poured out of the mess hall chanting religious slogans in support of Khomeini and attacked the outnumbered pro-Shah officers sent to arrest them. "I rang the Prime Minister and gave him the news," Amouzegar explained. "It was about midnight. Someone woke up Bakhtiar. When he came to the phone he told me that he had heard about the troubles but that it was nothing serious and went back to sleep." When units of the Imperial Guards failed to put down the mutiny the situation turned into an insurrection. By Saturday, February 10th, the arsenal was opened, and thousands of weapons were distributed to crowds outside the air base. It was 3a.m. when Bakhtiar rang Amouzegar. "He sounded concerned," Amouzegar remembered. "We talked about a counter-insurgency plan which he planned to unveil later in the day at a special meeting of the National Security Council." As people barricaded themselves against the tanks and jeeps sent to enforce a military curfew, Bakhtiar ordered the Air Force Chief General Rabii to bomb the defense and ammunitions factory. Rabii refused calling the plan crazy and impractical. Discussion then turned to a list that SAVAK General Moghaddam had prepared. "The list which had included 200 names a few weeks ago had grown to 308," Amouzegar revealed. "These people were to be arrested and taken to a deserted camp near Tehran. They included Ayatollah Khomeini, his comrades at the Alavi School, and scores of journalists and national front and leftist activists." For some mysterious reason the plan was never carried out. Worse the news was leaked to the revolutionary camp and this led to further fighting.Unable to enforce the curfew, General Mehdi Rahimi, the military governor, watched helplessly as the mob captured the key police stations, prisons, barracks, and ministry buildings. By Sunday, February 11th, the military machine and its leadership were in complete disarray. The events that followed sealed the fate of Bakhtiar's government forever. On that fateful Sunday, Amouzegar telephoned Bakhtiar early in the morning. "The Prime Minister sounded upset," Amouzegar recalled. "It was 8a.m. and he was looking for Khosrowdad who was nowhere to be found. Later he complained that he could not find Rabii. Finally, after some calls, he had been told that the generals had been summoned to a military briefing by General Gharabaghi." Depending on which version one refers to, the role of General Gharabaghi in undermining Bakhtiar's government is irrefutable. There are those who call him a traitor and a turn-coat. Others believe that he did what he could to maintain the cohesion of the armed forces -- an impossible task once the Shah had left the country. Gharabaghi himself denied the charges and blamed Bakhtiar. "Gharabaghi never got on with Shapour Bakhtiar," Amouzegar said. "Whether he was a traitor or not the fact is that he was not made for the job which he had been selected. An Azerbaijani officer who spoke Farsi with a heavy Turkish accent he was not popular among his peers. At the end he chose to compromise." In any case, while Bakhtiar waited for Gharabaghi to report to his office, the latter had summoned 27 military commanders to the largest meeting in the history of the Imperial Iranian Armed Forces to consider their options. The picture from the front was dismal. Every commander declared that they no longer could count on their forces to establish order. The best solution was to round up their troops from the streets and retreat back to barracks. Few had any illusions. After two hours of discussion it was agreed that a communique be issued in which the High Council of the Imperial Iranian Armed Forces would declare their "neutrality" in the political rift. The text was hand written by General Hatam and signed by every officer in the room except for General Shafaqat, Bakhtiar's War Minister, who crossed out his name. At about 10:20a.m. Gharabaghi telephoned Senator Jaffroudi who had planned to hold a meeting at 4p.m. with Bakhtiar, Gharabaghi, Bazargan and Ayatollah Motahari, at his house. Some have speculated that Bakhtiar was planning to offer his resignation to Bazargan but Amouzegar maintained that this was not the case. If Senator Jaffroudi's version is true, Gharabaghi had asked him to be put in touch with Bazargan, Khomeini's designated prime minister of the shadow government. The Field Marshal went on to explain the Army's decision to declare its "neutrality" and that all the senior military commanders had endorsed the decision. "Do you understand the consequences of this decision?" Jaffroudi repeated, angrily. "It means you have surrendered the state. I suggest you contact the Prime Minister immediately. His life is in danger and you are responsible for his safety." It was half-past-ten when General Gharabaghi rang Bakhtiar and told him the news. It was a hard blow. Everything was lost. The generals had by their actions destroyed the last pillar capable of holding back Khomeini. At 1p.m., after an hours delay, Amouzegar authorised the radio to play the Army's communique. For a moment the Prime Minister sat at his desk in front of a late and cold lunch. He had no appetite. A half-bitten green apple lay on a plate. Suddenly machine-gun bullets hit the Prime Minister's office. Amouzegar rang him and asked if he needed a car. "Bakhtiar turned down my offer to come and fetch him," Amouzegar said. "He said that he was leaving soon with his security officers." In his memoirs, Bakhtiar explained how he calmly took his winter coat and bade farewell with Pari Kalantari, his loyal secretary. As he climbed down the stairs, she asked him if he were coming back. "I will be back," Bakhtiar told her. Soon afterwards, Bakhtiar vanished. Gharabaghi changed into civilian clothes and left his H.Q. for Jaffroudi's house where after meeting with Bazargan he went into hiding. Both men eventually escaped to Paris. For the others, a worse fate awaited them. Hundreds of other generals and imperial officials believing in Khomeini's mercy would soon be shot by firing squads. At 6p.m. rebels captured the NIRT station. A presenter announced: "This is the Voice of the Revolution!" As Tehran fell under mob rule, Sirous Amouzegar became the last minister to leave his post. As he related the story to me in that Paris cafe, Amouzegar's eyes clouded over with tears. It was the first and last time he showed any emotion. During the dying hours of the Bakhtiar government, Amouzegar had been sitting in his office pondering the future. No more than ten employees remained in the Ministry of Information building. There was a knock. A sergeant walked into the room and saluted smartly. He was dressed in full battle gear. "Yes, what do you want?" Amouzegar asked. "What is going to happen to us now, Sir?" the sergeant wanted to know. He had heard the army's announcement and felt torn between his sense of duty and the crumbling situation. For two days his men had not eaten anything as the cooks were on strike. "I told him to go home," Amouzegar said. "But, Sir, we have our orders to defend all government installations until the last bullet, the young sergeant insisted." Continuing his story, he said: "I told the sergeant that it was all over and suggested that he hide his weapon somewhere in the building and change out of uniform. I told him to leave at once. Save yourself, I told him, before it's too late." Swallowing a glass of water, Amouzegar paused for a moment, trying to control his tears. More than twenty-three years had passed from that day but the feelings were the same. The world was crumbling all around him even here in this French cafe, here the bored waiter looked at his watch praying for us to leave. "The generals may have betrayed us," Amouzegar said. "But the rank-and-file were loyal and waiting for their orders. The poor sergeant came up to me and placed his head on my shoulders and wept like a child. I was so overwhelmed that tears flowed down my face. Later, the sergeant saluted me and disappeared." Amouzegar was the last person to leave the Ministry and dutifully switched off the lights on his way out. Angry crowds were milling in the streets looking for enemies of the revolution. As he stood on the steps a van appeared and a voice shouted: "Get in, Mister!" "I looked up and immediately recognised him," he said. "The driver used to deliver copies of Talash magazines between the printing house and the Prime Minister's office. I thanked him and said that I would make my own way. That night, as the capital burned, I drove to my house and when it became too dangerous I slept at Abbas Qholi Bakhtiar's place before moving in with my sister." Amouzegar kept low for a while until the snow had melted spending his time listening to the radio and reading the depressing stories in the daily newspapers. Arbitrary arrests, summary executions and chaos was the order of the day. After several weeks in hiding, Amouzegar could no longer take it. He decided to call Admiral Ahmad Madani who held the senior post of Defense Minister in the Provisional Government. "I'm fed up of hiding," he told Madani. "If they want to arrest me they can come and do it now!" Madani replied that in a recent meeting Prime Minister Bazargan had said that the country needed "good people" even those who had served in the Shah's imperial regime. "If you wish," Madani said offering an olive branch, "I will come and fetch you tomorrow and take you to see Bazargan. I'm sure he will help." Amouzegar declined Madani's offer. After some assurances he decided to go back to his own house. Few days after the Persian New Year, on March 27th, 1979, Amouzegar went to see his friend Dr Razmara. They chatted about old times and the situation in the country. Bakhtiar was still in hiding somewhere in Tehran despite a nation wide search for his arrest. When he returned home that evening, Amouzegar received a visitor. The man was anxious to get him out of the country. "There is a car waiting for you outside," he told him. "I will drive you to a secret spot where you will board a helicopter that will fly you to Turkey. From there you will be free to join your family in Paris." "It was a difficult choice to make," Amouzegar confessed. "I went upstairs and asked my old father's advice. He went into deep thought and began pacing the room." When the pacing had stopped, the old man told his son that it was better if he did not escape. "A fugitive can never live in peace. Stay here. You have not done anything wrong. At most you will be arrested and spend a month in jail then released." The man who had come to save Amouzegar was furious when he heard the decision. "You are both insane," he shouted as he left the house, slamming the door behind him. At midnight the doorbell rang. "I opened the door," Amouzegar remembered. "It was Dr Razmara." For an instant, Razmara stood there smiling. Then slowly he said, "They finally got me." As he spoke two armed men emerged from the shadows. In a few minutes, Sirous Amouzegar and Dr Razmara, two of Bakhtiar's senior ministers, were sitting in a car watched by Pasdarans, or Revolutionary Guards. "Where are you taking us?" one of them asked. "Ghasr Prison," came the reply. During his eight months captivity in revolutionary hands, Amouzegar was convinced that he would soon be released. One day at Ghasr Prison where many of the Shah's closest officials awaited trial, Amouzegar noticed the ex-prime minister, Amir Abbas Hoveyda taking some exercise in the same courtyard where he eventually met his ignominious death a few days later on April 7th, 1979. "I saw him standing in that courtyard," Amouzegar revealed emotionally. "He had lost some weight. But he still managed a smile and waved at me. I waved back at Hoveyda not realising that it was for the last time. I was very upset by his fate." Life in Ghasr was no picnic. "These were horrible times with countless executions taking place regularly," Amouzegar said. One night they shot 22 people among them the distinguished Dr Khalatbary, Hassan Pakravan, Mansour Rouhani, General Nader Jahanbani, and Parviz Nikkhah. Another day it was the turn of Air force Chief Amir Hossein Rabii and SAVAK Chief Moghaddam. "One of my cellmates was General Ali Neshat, the former commander of the Imperial Guard," he said. During their walks in prison a crestfallen Neshat told Amouzegar how he had been forced to hand over Niavaran and the remaining royal palaces to save his men. It had been a humiliating affair. He also told him that had the order been given his artillery guns could have wiped out Khomeini's headquarters. "Then why didn't you?" Amouzegar had asked him. General Neshat who was soon to face a firing squad had fallen silent. For the next three months, Amouzegar was subjected to long hours of interrogation. "I was not tortured," he said. "But eventually I told my interrogator that I would tell him everything if he would just say what was my crime." According to Amouzegar the interrogator had stared at him and in a cold voice said, "We have a taped conversation between Shapour Bakhtiar and yourself on the eve of 22 Bahman. Every word has been transcripted and is in your file." Returning to his cell Amouzegar looked like a ghost. When Ahmad Mirfenderski, also in prison, asked him what was the matter, Amouzegar opened up to him. Mirfenderski also went pale. "Just deny it's your voice," he advised.When Abbas Qholi Bakhtiar heard the story he told Amouzegar not to worry. "The worst that can happen is that you will be shot," he said jokingly at the thought. "It will be a quick death. A bullet and a little smoke, then it's all over." Luckily nothing happened after that. On July 7th, a prison guard called out Amouzegar's name. "I went down the steps fearing the worst," Amouzegar said. "The guard said that he had a message from Abbas Qholi. I asked what it was and he said, 'Agha raft.' In this way I learned that Shapour Bakhtiar had fled the country. This shows how popular Bakhtiar was even among the prison guards." Amouzegar was released from Evin prison on August 19th soon after his transfer from Ghasr a few weeks earlier. "I still remember the day. It was the day they executed Mr Khoshkish, the ex-head of the central bank. The newspaper on that day carried a photo of me with a caption that read, 'A dangerous man.' "Did you know that I am the only Minister of Information who was not shot?" Soon after his release, Sirous Amouzegar phoned Dr Bakhtiar in Paris where the former Prime Minister had formed the Iranian Resistance Movement which apparently had the late Shah's covert blessing. He asked him if he wanted him to join him. "It's better if you stay where you are," Bakhtiar advised. "We are planning something big. Your presence in Iran may become invaluable one day." A year later a group of Air Force officers and civilians were arrested by the revolutionary authorities in the aftermath of the July 1980 plot. It soon transpired that the conspirators had received financial and logistical support from Bakhtiar's office and had hoped to bomb Ayatollah Khomeini's residence and forment a coup. Over 300 people were shot in the terrible days that followed. "I was arrested again," Amouzegar explained. "This time my house was ransacked by the authorities. They threw all my music and book collection into the street and drove their cars over them. My poor mother kept shaking her head. Fortunately, I was released after a few questions and shortly afterwards I fled Iran." In Paris Amouzegar joined Bakhtiar's movement. "Bakhtiar was full of confidence that we could overthrow the mullahs. He had received a lot of money for his operations. We worked together until 1986 when we parted ways. " It was twilight. We had already left the cafe and were heading towards the Metro. There was so much more I wanted to know. 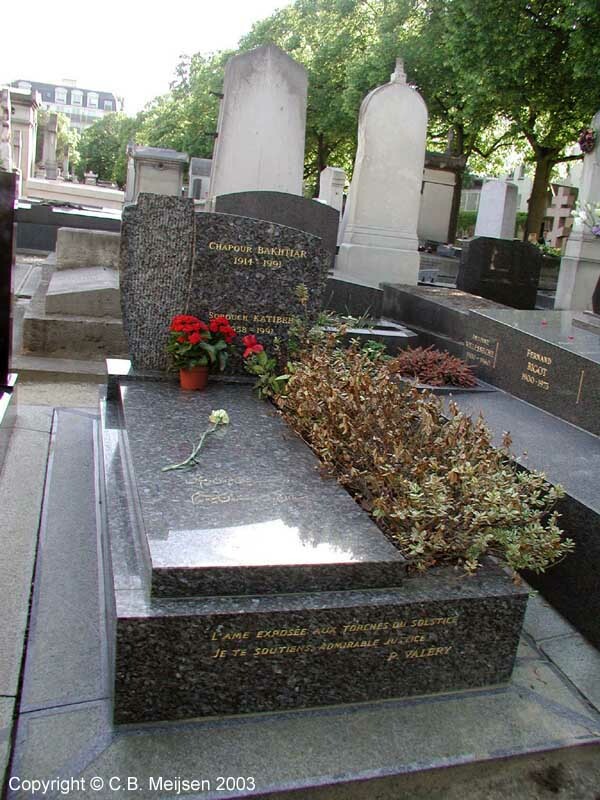 I was conscience of the fact that nearby in the Montparnasse cemetery was the lonely grave of a brave man who had tried in vain to reverse the Ayatollah's nightmarish plans for Iran. "One day I would like to place some flowers on Bakhtiar's grave," I said suddenly. Amouzegar stopped and looked at me, his eyes shining like those of a grateful man. "What a great idea," he said genuinely touched. "I am sure Dr Bakhtiar would like that very much." I kept my head down. Earlier, Amouzegar had told me that despite his loyalty to the man, Bakhtiar had his weaknesses. Towards the end of his life, Bakhtiar had alienated many of his followers and lost any illusions of seeing his country again. He remarried a young Iranian woman who bore him a son. Almost bankrupt, Bakhtiar had closeted himself at his heavily guarded villa on 37 rue Cluseret in the Parisian suburb of Suresnes. On the night of August 6th 1991, the 77-year old Bakhtiar and his secretary Soroush Katibeh were brutally assassinated by three undercover agents sent from Tehran. "They cut his throat with a kitchen knife and left him to bleed to death on his leather sofa," Amouzegar said. "I know that he put up a fight until the end. At his funeral I was in a state of shock. I could hardly talk." We felt sad for Bakhtiar, an Iranian patriot and liberal who had placed such great faith in France as a bastion of democracy and human values. As we talked in the semi-darkness on that August night a sense of disgust pervaded the gentle air. Clearly, the negligence of the French police chosen for Bakhtiar's safety and the trial of the suspects charged with the gruesome murders, continued to haunt Amouzegar. Although the court concluded that the killings had been ordered by the leaders of the Islamic republic, the Mitterand government had appeared ready to put the incident behind them in favour of lucrative trade deals. The French, who had once harboured Khomeini as the leader of the revolution against the Shah did not want to upset the mullahs. Two of the assassins, Fereydoun Boyerahmadi and Mohammed Azadi, managed to escape to Iran. "We Iranians are an ungrateful bunch," Amouzegar told me before descending into the Metro. For a moment we were interrupted by the roaring trains in the tunnels. "What do you mean?" I asked. Amouzegar smoothed his moustache with his fingers. "Had Bakhtiar, or even Hoveyda, been Europeans," he said, "they would have been honoured by their people. Both men were exceptional in their own right. Both men paid a terrible price for their service to Iran and their beliefs." As the train pulled away I waved at Amouzegar who smiled from behind the window. It was almost nine in the evening and hardly anyone in sight as I went back home. My interview with Mr S. Amouzegar took place in Paris last August 2002. Story completed on February 10th, 2003. Shahpour Bakhtiar, the last Prime Minister of Iran, was stabbed and beheaded on this date in France. The above article, one of your favorites, is now available on HEZBEMIHAN site.